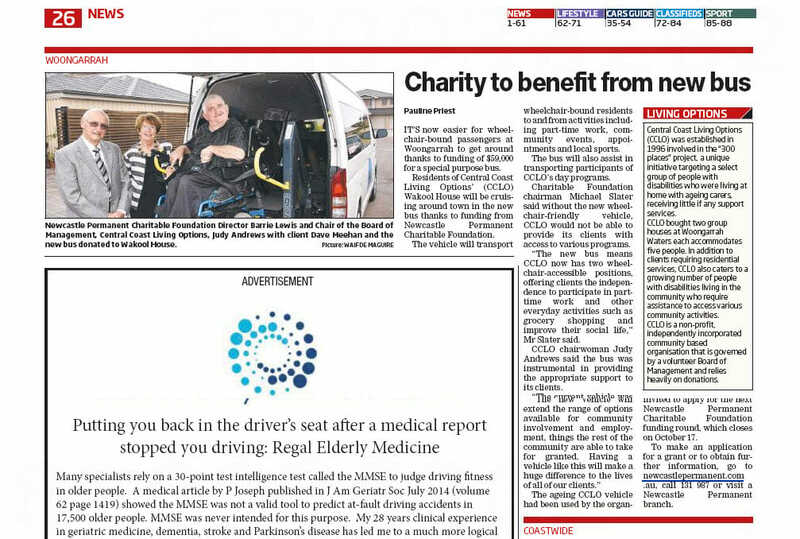 ‘Charity to benefit from new bus’ article featured in The Central Coast Advocate on Friday September 5 on Page 26. It can be seen here in the digital edition and also read below. “IT’S now easier for wheelchair-bound passengers at Woongarrah to get around thanks to funding of $59,000 for a special purpose bus. Residents of Central Coast Living Options’ (CCLO) Wakool House will be cruising around town in the new bus thanks to funding from Newcastle Permanent Charitable Foundation. The vehicle will transport wheelchair-bound residents to and from activities including part-time work, community events, appointments and local sports. The bus will also assist in transporting participants of CCLO’s day programs. Charitable Foundation chairman Michael Slater said without the new wheelchair-friendly vehicle, CCLO would not be able to provide its clients with access to various programs. 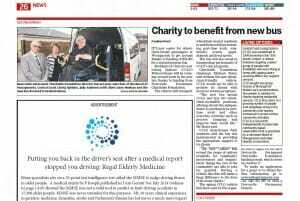 “The new bus means CCLO now has two wheelchair-accessible positions, offering clients the independence to participate in parttime work and other everyday activities such as grocery shopping and improve their social life,” Mr Slater said. CCLO chairwoman Judy Andrews said the bus was instrumental in providing the appropriate support to its clients. “The current vehicle was not modified for wheelchair access and restricted the clients that could be transported,” she said. Central Coast Living Options (CCLO) was established in 1996 involved in the “300 places” project, a unique initiative targeting a select group of people with disabilities who were living at home with ageing carers, receiving little if any support services. CCLO bought two group houses at Woongarrah Waters each accommodates five people. In addition to clients requiring residential services, CCLO also caters to a growing number of people with disabilities living in the community who require assistance to access various community activities. CCLO is a non-profit, independently incorporated community based organisation that is governed by a volunteer Board of Management and relies heavily on donations. isation for the past eight years. Local charity and not-forprofit organisations are invited to apply for the next Newcastle Permanent Charitable Foundation funding round, which closes on October 17.